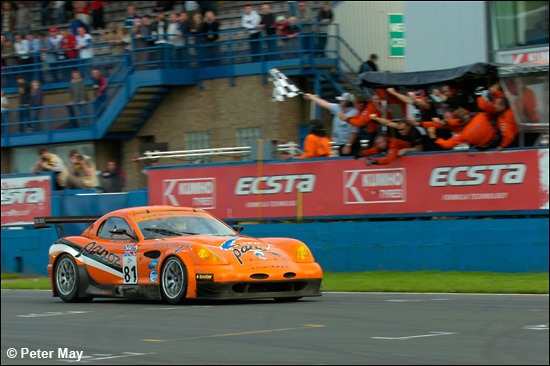 Donington Park was the scene for Round 4 of the 2006 Le Mans Series and the pair of Team LNT Panoz Esperante GTLMs were once again looking to take top honours amongst the cream of European GT competitors, after their historic win in June at the Le Mans 24 hours. The team’s home race would present the usual challenges, not only from a punishing six hour 200 lap plus dash around Donington Park’s Grand Prix circuit, and the usual challenge of having their own race amongst a couple of dozen faster prototype racers and GT1 supercars, but also the challenge posed by a trio of super quick new Ferrari 430s, a pair of Dutch Spykers and a squadron of the previous benchmark GT2 car, the Porsche 911 RSR. For the two Team LNT cars it has been a year of mixed fortunes thus far: the #82 car of Lawrence Tomlinson and Richard Dean, aided and abetted at Donington with Marc Hynes again joining the crew, has been in the hunt at every race with a pair of strong podium finishes boosting a points tally that left the crew in with a strong chance of title contention, so long as a good points finish could be secured here. 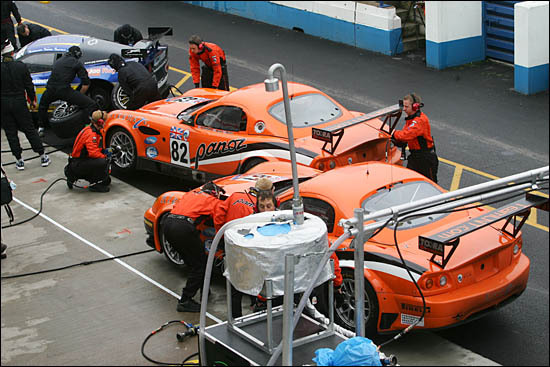 In contrast, the sister #81 car, despite the best efforts of the Rob Bell / Warren Hughes driver pairing, had pulled all of the bad luck available before Donington and despite being in contention everywhere, they were quite astonishingly without points at all after three rounds. Here are preparations underway during the rain on Friday afternoon. Both Esperantes were well on the pace for much of the first practice session of the meeting on Saturday morning, Rob Bell at the wheel of #81 and Lawrence Tomlinson in #82 both in the top five 5 for the session. But shortly before the end of the session, the boss handed over #82 to Richard Dean, but the car was immediately in trouble, Richard pitting before completing a single flying lap with a loss of power. 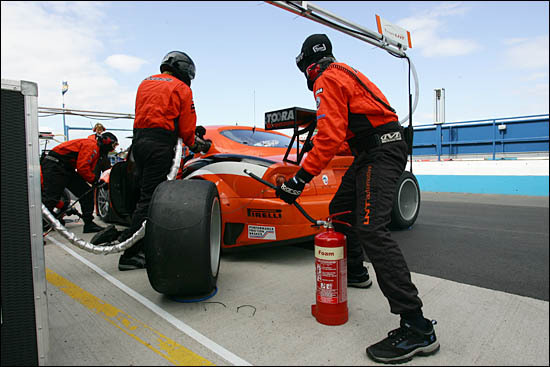 Team LNT’s crew was immediately on the case and the news wasn’t good, the team opting to change the 5 litre V8, the very first time that has been necessary for the team since they began running the Panoz Esperante. The worse news was that the engine change would prevent the #82 car from taking to the track in the afternoon’s second practice session. #81 was out and running well, fastest of all for 85 minutes or so of the second session, before being finally bettered by an Italian run Ferrari. Qualifying was next up and whilst the #82 car was back in rude health, there was another problem that would hamper progress. With Richard Dean not having driven three laps in the meeting so far, and Marc Hynes not yet having driven at all, the imperative was to get both drivers to complete the required three timed laps: any hope of an attack on the top end of the timesheet was out of the question with just a short 20 minute session. The team decided instead to ensure that the V8 transplant surgery had been successful. For the #81 crew however the chase was on for an advantageous grid position, and Warren Hughes posted a time good enough for provisional pole in the early minutes of the session but on a busy track a clear run was tough to find and, despite going faster later in the session he couldn’t quite match the pace found by another man with local knowledge, Tim Sugden. 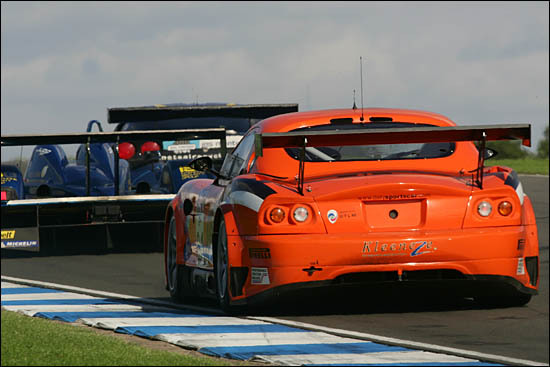 He set class pole in his Virgo Ferrari, the orange Panoz eventually relegated to fifth place in GT2, the times behind the Ferrari separated by just tenths of a second. Team LNT set to work on both cars immediately and by the following morning, race morning, the two Panoz were ready and waiting for a quick fire warm-up session - and the extra effort had paid off. The session ended as a Team LNT 1-2 with the #82 car to the fore after its engine change yesterday and the only car into the 1:32s. 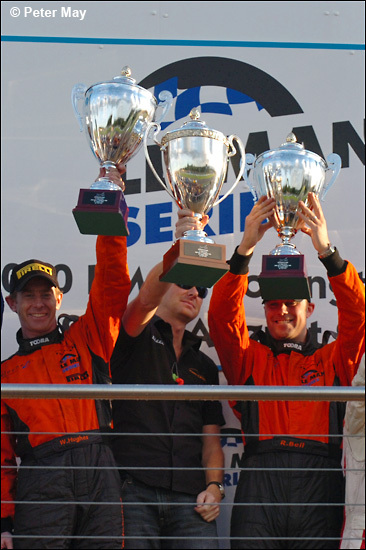 The major threat for the race was always looking set to be posed by the Ferrari 430s, and from the off that was the case immediately, Tim Sugden and ex-F1 man Andrea Montermini setting the early pace, but the Ferraris were being chased hard by a group consisting of the #81 Panoz, Rob Bell taking the start, a pair of very quick Porsches and the faster of the two Dutch Spykers. Richard Dean in the #82 car meanwhile was making great progress from the back of the grid, up into the top ten in the class very quickly. 15 laps in and Bell had won one battle, the #81 car was pulling clear of the Porsches and Spyker and he was doing all he could to hang on to the Ferraris ahead. The Ferraris meanwhile were having a battle of their own and Bell was happy to sit back and watch and wait for an opportunity to get onto terms. 30 laps in (for a race due to take in 249 trips around Donington Park) and suddenly Team LNT led the class: a clash between the two Ferraris had gifted the place to Rob Bell, his waiting game had paid off and the Esperante was running faultlessly. The previous leader, Montermini had fallen to sixth in class, and the second Panoz was now right on the tail of the 430, Richard Dean still making excellent progress in the #82 car. Sugden had been less hampered by the Ferrari-on-Ferrari clash and he was soon back on the tail of #81, blasting past once again as the first routine pit stops began. There was however yet another twist in the tale! 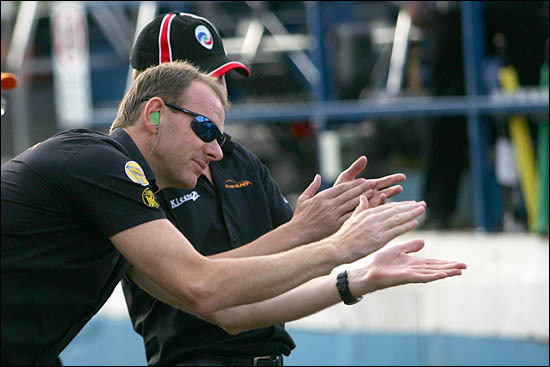 70 minutes and Sugden and Bell are still having a right old ding dong at the head of GT2 – the Ferrari pits, Bell leads. The Porsches behind also pit - and Montermini’s Ferrari and Bleekemolen’s Spyker. 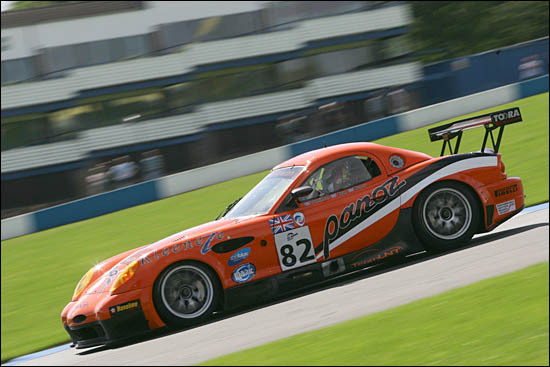 The Panoz pair powered on – a very economical 5 litre supercar! Neither was the economy a result of hanging about: Rob Bell sets his best lap of the race after the rest of the GT2 pack had pitted and, with the 80 minute mark looming, Team LNT cars were first and second in class, 50 seconds apart. Bell finally pitted in the #81 Panoz, still very much in the lead of the class after an astonishing 82 minutes, Warren Hughes took over and rejoined still retaining the lead, some 12 seconds clear of the quickest of the Porsches, both Ferraris now having suffered further problems. Lawrence Tomlinson meanwhile was now aboard #82 and was back up to 8th in class. But his race would be short-lived, the car suddenly losing drive with a suspected driveshaft or differential problem. Team LNT’s boss turned off the circuit after the Old Hairpin and carefully parked the car, a disappointing end to a race that had promised to aid their chase for the GT2 title. But #81 was still in fine fettle, Warren Hughes holding off the best pair of Porsches still in contention and the Virgo Ferrari, all four lapping as a growling, screaming pack. Seven seconds was all that separated this quartet as two hours approached. Hughes looked in control and again there was trouble free running on tap for the Panoz, whilst the rest hit trouble. Both Ferraris and the fast IMSA Performance Porsche would hit trouble and the GT2 Championship leading Autorlando Porsche was simply being outpaced. As two and a half hours approached, Warren Hughes enjoyed a 40 second class lead, the #81 Panoz up to 17th overall. Hughes finally pitted once again for Rob Bell to climb back aboard. The #97 Ferrari had been making up ground and with the Panoz’s better fuel economy in effect leaving it on a different pit cycle, the Ferrari, still having to pit, was around 40 seconds ahead with Porsche star Marc Lieb an almost identical amount behind the Panoz, the Porsche too having to pit. Bell was able to match the Ferrari’s pace and held station to take the lead as the Ferrari made its next stop, Andrea Montermini climbing back on board the 430. 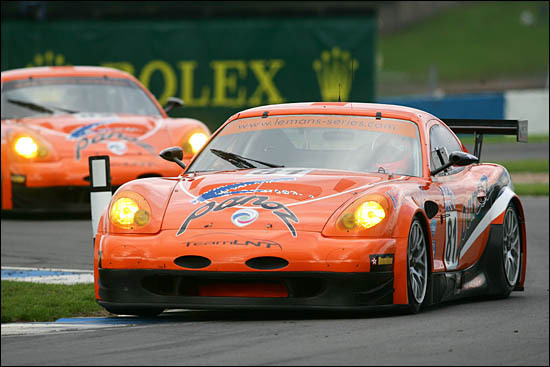 Hour 4 and Montermini was pushing on, back up to second in class and closing in on the metronomically quick and reliable Panoz. Warren Hughes meanwhile was summing up progress so far: "Rob held his gap really well to the Ferraris and handed the car back to me in the lead (after the two Ferrari 430s clashed). The car is very comfortable. We can get very good pace without taking risks or hurting the car. We’ve had a little bit of oversteer from the start but the good thing is that it isn’t deteriorating through the stint. We have got a very good race car. There is more there if we need it, I felt able to put in a 1:33.0 every time I got a clear lap." Soon there were really only two cars battling for the class win, the Ferrari closing slowly on the Panoz, the gap still 32 seconds at the 4 hour mark, both cars having completed 147 laps thus far. 160 laps and the gap was still 32 seconds, Warren Hughes fending of Andrea Montermini, but the Italian car was beginning to find real pace. The Ferrari’s charge and the ever present traffic soon saw the gap begin to tumble. Less than 90 minutes to go and the gap was down to just nine seconds and the 430 was still closing in. All of a sudden the Panoz looked vulnerable. The Ferrari man was having to push very hard indeed, whilst the Panoz was playing the long game, and it was soon to pay off. Lap 175 and the Ferrari took the class lead, but not for long, as, just before five hours the 430 clashed with a faster prototype, both cars ending up stuck fast in the gravel. 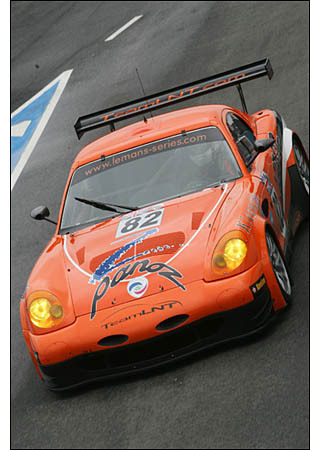 The Panoz swept back into the class lead almost immediately, now 14th overall. The car had been supremely reliable – and quick with it – and the team’s tactics had worked perfectly. Half an hour / 20 laps to go and the Panoz pitted from the lead of GT2, Hughes hands over to Bell, "because we can," comments Lawrence Tomlinson. 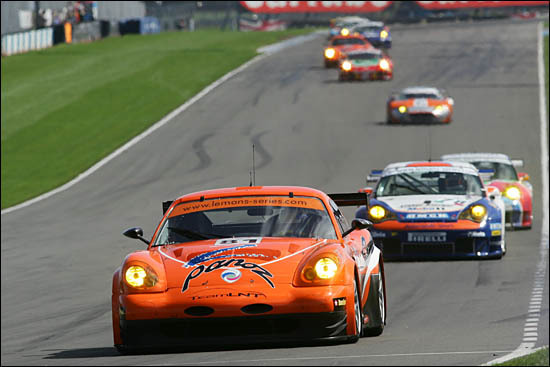 By the time the chequered flag flew, the #81 car had completed 224 Laps, a full lap ahead of the Marc Lieb / Joel Camathias Porsche, with the Ferrari back in the hunt by the end, but two laps down on the Panoz. 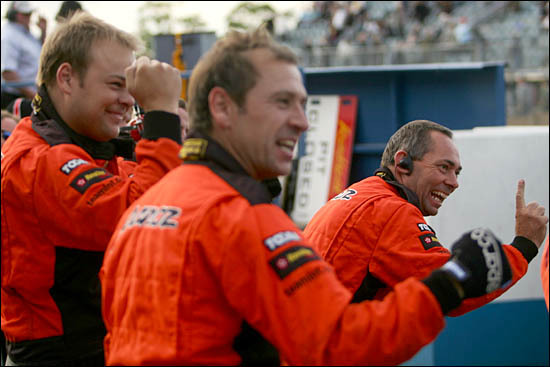 So a second international win for the LNT Panoz boys, Le Mans and a home win, not at all a bad tally with a final shot at more 2006 Le Mans Series glory still to come at Jarama in Spain next month.